Chris serves as a Project Manager focused on global outreach and strategic business development for emerging tech ventures seeking new customers, partners and distribution channels in North America and into other global markets. He brings an extensive network and expertise in corporate sales/marketing and strategic business development deal-making across major vertical markets including Oil/Gas, Pulp & Paper/Printing, Industrial Water Treatment, Telcom/TV/Satellite and IT/Cloud/SaaS. He’s held numerous executive positions in tech transfer, new venture creation/startups and has directed federal & state funded non-profit and private/for profit high tech incubators/accelerators. Operating his own consultancy, Chris has coached and mentored dozens of entrepreneurs, tech-based startup and growth-stage ventures assisting them with ‘Go to Market’ sales and distribution strategies, business development, new customer acquisition and raising capital. He’s serves as a board advisor and as an interim C-level executive for clients including: Uphotomeasure.com (Digital Measurement Software), Corent Technologies (Cloud/SaaS), SpeedTrack (BI/BA/e-Search/Analytics) Oil for America (Oil/Gas Development), Kline Consulting/ERS (Green Solvent solutions) New Frontier Media (TV/Media/Content), D4Media (Digital Media/Web Services), Raysat (Mobile TV/Video Content Delivery), Joan Baker Design (Giftware), NexPower (Integrated Circuits) and E-Spin (Wireless/Telcom). He’s done dozens of technology assessments and evaluated commercial viability for innovations at National Labs, University Tech Transfer Offices and AT&T Labs. Chris has also helped his clients raise and close over $31MM in seed or Series A & B rounds of capital. Most recently, as co-founder of Meetrix a Cloud/SaaS-based Unified Communications & Collaborations venture, Chris helped raise two rounds of $1.5 and $1.2MM respectively, while also winning the prestigious 2011 IBM Beacon Award for Cloud Apps and runner up for Best of Show/CTO Award @ IBM Lotusphere 2012. Prior to Meetrix, he was responsible for international business development and major OEM accounts for EchoStar/DISH Network including: Bell Canada, Sirius Radio, Telefonica, Polsat, SkyTV, PLDT/Smart Communications and Telmex. While at EchoStar he successfully crafted and launched both DISH on Board Airlines and Mobile DISH and built out overseas JV partnerships with Philippine Long Distance/Smart Communications for launching a nationwide pre-paid TV service in the Philippines as well as DISH Mexico TV. As a tech scout, Meyers also identified Sling Media as an acquisition target for EchoStar/DISH. In 1997, as Executive Director of the Center for Technological Innovation (CTI) in Charleston, SC (an IC² Institute project funded by NOAA) – CTI became the first incubator in America to launch an on-line, Virtual Incubator to help broaden its ability to serve entrepreneurs state-wide and nationally. His team established a TechStar’s like program called ‘Spend a Summer Abroad’ in Charleston, SC designed to build startups from lab and university inventions from NOAA and MUSC technology, leveraging MBA and undergrad student teams. One CTI venture delivered a new $3MM/year line of business back to MUSC and another won a university business plan competition and closed $1MM from Tech Coast Angels in Los Angeles; where it resides today with 45 employees and was recently acquired by a Canadian firm. During his tenure, Chris was awarded the ’40 under 40’ award by Charleston Business Journal for his innovative efforts. He’s proud to say Charleston now has three distinct tech incubator/accelerator facilities throughout its metro region. As VP Corporate Operations with Select University Technologies in Costa Mesa, CA, Chris successfully licensed or took options to license over 30 technologies from major R&D universities to commercialize breakthrough technologies that served as the foundation for startup ventures in a portfolio that included incubator/accelerator services and a captive angel/venture fund. Prior to receiving his Master’s Chris had a history of helping his employers grow top line revenues and higher margin products or new business units and won numerous performance awards for his efforts either individually, or on behalf of the companies he worked for including National Fuel Gas, Hammermill Paper/International Paper and Aqua Dynamics Corp.
Meyers recently relocated from Denver, CO to Austin, TX and holds a B.A. in Geology from Mercyhurst University and a M.S. 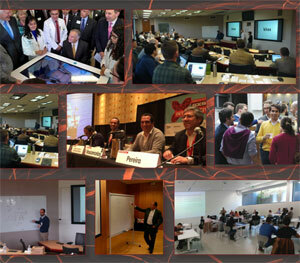 in Science & Technology Commercialization from the IC² Institute and The University of Texas at Austin. Meyers is committed to working entrepreneurs and organizations that aspire to “make a difference” in the world. He’s a current or past member of AUTM, Tech Transfer Society, NBIA, NCIIA, Silicon Flatirons and actively participates in numerous Meetup groups regionally. In his spare time he enjoys water sports, yoga, skiing, biking, hiking and fly-fishing.